AMONG THE HALF DOZEN or so standard questions fly fishers eventually get around to asking each other is, What’s your favorite fish? Some say your answer to that will be deeply revealing — exposing you as a covert aristocrat if it’s Atlantic salmon, a closet bubba if it’s largemouth bass, or whatever — while others just think it might be interesting, but sooner or later, in one way or another, the question comes up. For the longest time I thought I was fickle because I hardly ever gave the same answer twice in a row; it was brook trout one time, browns the next, and maybe bluegills the time after that — whatever I’d caught most recently. But then I realized I was giving the right answer to the wrong question. The fact is, it’s fishing with a fly rod I’m stuck on, but I’ll pretty much go after anything that doesn’t have legs, and my favorite fish could be a carp if that’s what’s taking line off my reel at the moment. Still, like a lot of fly fishers in the Rocky Mountain West, I have a real soft spot for cutthroats because they’re our only native trout. When I first started fishing for them, some people around here still called them just that, natives, and knowing only that, it was possible for me to hike miles into some pretty little alpine lake in the wilderness area, catch a few ten-inch cutts, and get downright mystical about returning to the source. On those cool, quiet summer evenings when no jets passed over on their way to the old Stapleton Airport in Denver, I could drink the few warm beers I’d packed in and have myself a borderline religious experience. I was still fairly new to Colorado then: fresh from the Midwest, young, innocent if not plain dumb, and prone to fits of romanticism, so naturally I was disappointed when I learned that the cutthroats in those mountain lakes weren’t native in the finest sense of being the direct descendants of the ancestral fish. But then the best guess from most of the experts was that there were no ancestral fish up there. Most of the high-altitude lakes along that stretch of the East Slope, they said, were separated from the lower waters by natural barriers and were fish­less when the West was settled. The trout in them now are the results of early, haphazard stocking — official and otherwise. A fisheries biologist once told me that in the old days anyone with a bucket or a milk can could get a load of fingerling trout and put them wherever he wanted to, and that the first plantings done by the Division of Wildlife itself weren’t much more scientific than that. The result on the one hand was that a lot of already depleted native cutthroat fisheries were destroyed altogether by the introduction of brown, rainbow, and brook trout. On the other hand, some thriving fisheries were established where before there had been no fish at all. You can apply revisionist criticism to all that if you want to — asking, Why didn’t those dumb schmucks a hundred years ago know what we know now? — but the fact is, it was mostly done with a good heart and, in some cases, the kind of monumental effort you only see from people convinced they’re doing the Good Work. For instance, many of the trout in my neighborhood wilderness area were planted by an old private club that packed fingerlings in on horseback and, now and then, on the strong backs of volunteers, for no other reason than that it pained them to see pretty mountain lakes with no fish in them. They even went to the trouble of stocking cutthroats. They were Yellowstone cutts — native to the region, though not to the state — but, given the information and the hatchery stock available at the time, that’s a pretty fine point. If there had been cutts in those lakes a century ago, they’d have probably been greenbacks. Greenback cutthroats were thought to be extinct by the late 1930s, but then the legendary Dr. Behnke at Colorado State University located a small, pure-strain population in a little creek near here, in the high headwaters of what was once their native range, and now they’ve been introduced into a dozen or so lakes, streams, and beaver ponds in and around Rocky Mountain National Park. You can fish for them on a strict catch-and-release basis (presumably, few people now living know what a greenback tastes like) and, although they may not have existed naturally in those particular waters, they would once have been found only a few miles downslope, and that’s probably close enough for government work. I think the first pure-strain cutthroats I knowingly caught were greenbacks, and that’s only because some people who really knew told me that’s what they were. The same fisheries guys say some of the cutts my friends and I catch in the more remote streams in the area are wild greenback-Yellowstone hybrids (the old fish crossed with the more recently introduced ones) and that in some cases they may even be “virtually pure” or “grade B” greenbacks. To be honest, I can’t always tell the difference between a pure greenback and a closely related pure Colorado River cutthroat, or either of those from the hybrids, and, when it comes right down to it, neither can most of the fishermen I know. The different races of cutthroat do have their distinctive markings — the spots on a greenback are bigger than those on a Colorado River cutt — but the kind of ironclad identification you’d be willing to swear to is just beyond most of us. Still, greenbacks are highly regarded around here. After all, they’re a once-thought-to-be-extinct fish that you can now go and catch, which amounts to a rare environmental miracle. Another miracle is that they were brought back by a recovery team made up of several state and federal agencies that cooperated for a long time and in the end actually accomplished something worthwhile. And they’re just a delightfully wild fish: surprisingly delicate in some ways and just as surprisingly tough in others. For instance, they’re so unused to competition that they’ll be crowded out by almost any other species of fish, which is what happened to many populations of them in the first place. But then when you look at that tiny little creek where they held out until they were rediscovered, it’s hard to imagine trout making it through a single winter there, let alone countless winters. It’s just a little trickle flowing through an aspen and willow bog, and if it weren’t for the Division of Wildlife NO FISHING signs you wouldn’t even know it was there. But if you find a tiny pool and crawl to the lip of it on your belly, there they are: miniature, jewel-like trout with impeccable pedigrees. And they say the recovery team had a lot of trouble raising them in a hatchery because, among other things, the greenbacks refused to eat commercial trout food. You’ve got to admire that. So anyway, I had a little crisis of faith when I found out the first cutthroats I went to so much trouble to catch weren’t quite what I thought they were, but I got over it. I mean, it wasn’t the worst case of lost innocence I ever had, and I did come out of it with the regulation western affection for cutthroats in general, not to mention respect for the tough old birds who humped those particular fish in on their backs in the first place. Since then I’ve caught real Yellowstone cutts in the Yellowstone River a few times. (By “real” I mean pure-strain, native fish living in their historic home water.) I’ve usually ended up doing that around Buffalo Ford in a god-awful crowd of other fishermen, but the trout were big and lovely and they had flawless bloodlines, so it was still a rush. Once some friends and I hiked a long way into a high mountain valley on Colorado’s West Slope — on a tip from a biologist — and caught what we were told were pure-strain Colorado River cutthroats. None of the fish were very big, but they were living in the stair-step beaver ponds and connecting channels that meandered down one of the prettiest little high­mountain meadows I’ve ever seen. There were wildflowers, snow-capped crags, and a stand of ancient, hundred-foot-tall Engelmann spruce trees that had either been missed by the old logging crews or, more likely, left because they’d have been too hard to get out. I remember there was a black trout in one of the pools. Not just dark, but black as a burnt stump. None of us could catch it. I have two snapshots from that trip. One is of my old friend A.K. holding a fat, foot-long cutthroat and grinning like it was a hundred-pound tarpon. The other is of Ed, casting to a perfect little beaver pond while standing in a field of wildflowers. I guess it was classic. One of the best things about native fish is that they’ve often held out in places that are either magnificently wild or at least overlooked. A few seasons ago I caught some pure Snake River cutthroats from a big reservoir in southern Colorado. That was also a beautiful spot, though in a different way. It was flat, brown, treeless, windblown, and, on that particular trip, cold as hell and downright lonely: the kind of place where one good, drunken country-western tune on the car radio could permanently break your heart. Once again, I know they were pure-strain fish because a fisheries expert with whom I would never argue told me they were. What struck me was that they were damned big trout, and I noticed that on a real pig of, say, five or six pounds, the normally fine, tightly packed pepper spots sort of spread out, as if they’d been painted on a balloon that had then been blown up. Just in the last couple of years I’ve gone several times to a drainage in British Columbia that holds native westslope cutthroats. One of the rivers we fished last summer is glacial in origin, with glass-clear, bluish-green-tinted water and a clean, light gray, bare rock bottom. The cutts there weren’t pale exactly, but they were subtly colored, muted, well camouflaged. I don’t think this gut affection for cutthroats is any great mystery. It’s just that for some of us who live and fish in the Rockies and who appreciate wildness, these are the trout that actually belong here the way we’d like to belong here: comfortably and thoughtlessly. 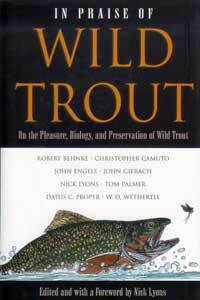 The same can be said of brook trout in parts of Labrador, Guadalupe bass in parts of Texas, and so on. Native fish look, smell, and taste of a place just as, to a fisherman, that place looks, smells, and tastes of the fish. Okay, fine, but if the trout at the end of a long uphill hike turn out to be a grade B strain or the wrong race for the drainage, well, I’m a mutt from somewhere else, too, so maybe I shouldn’t be too critical. I mean, my hometown hybrid cutts have a kind of romance all their own. Maybe less than a tepee ring, but every bit as much as an old abandoned trapper’s cabin. After all, things are seldom perfect and perfection itself may be overrated, but life can still be good. Cutthroats are just a kick to catch, especially when they turn up unexpectedly, as they still do now and then. Even a cutbow — the cutthroat-rainbow hybrid — can give you hope that there’s still a little wild juice left in the old river system. And if the cross happened in a hatchery before the fish were stocked, okay, but I don’t want to hear about it. We’re talking about symbolism now. Just about everyone I fish with gets inordinately excited about catching cutthroats, and they’ll mention a surprise cutt in detail in the first few sentences of the report on a new stream: “We caught browns and rainbows to about fourteen inches, and one cutthroat. He was eleven inches and had that red belly stripe like a greenback. Took a size sixteen Elk Hair Caddis. Sometimes news like that will make you want to go back to the same stream and go higher yet, looking for that secluded meadow stretch or headwater lake past the place where the rainbows or the brookies give out and it’s either all cutthroats or no trout at all. I still do things like that — though not quite as often as I used to — and, although I admire almost any fish that will eat a fly and I have a new favorite after every trip, catching a cutthroat still gives me that mindless don’t-confuse-me-with­facts buzz I got as a kid. It’s not a matter of symptomatic relief. Some of my favorite writers who have talked about trout fishing sometimes imply that it saves them from the big-time, high-pressure craziness of their lives — like a good, strong sedative. I sort of know what they mean and, although this ain’t exactly the big time, I do know what craziness is. But I have to take one more step back from that. I’d say fishing saves me from needing to be saved — sometimes just barely. I think the same goes for recapturing. Over the years I’ve held on to that old simpleminded enthusiasm, knowing that once it’s gone, it’s a waste of time trying to get it back. I don’t know how I know that, I just do.